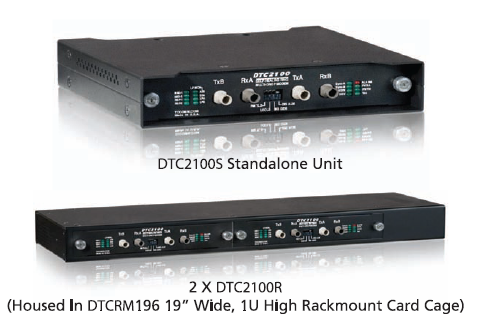 The DTC2100 Multi-Drop Fiber Optic modem provides maximum reliability for linking monitoring devices (typically RTUs or PLCs) to a Host Controller or CPU. It is completely transparent to data or communications protocols. The DTC2100 can be configured in Ring of Self-Healing Ring topologies. The Self Healing Ring scheme is sophisticated, i.e. it detects upstream and downstream failures on both Tx and Rx, and automatically re-routes any cable or equipment failure. DTC2100 master and DTC2101 slave units are interchangeable by setting a dip switch. “Multiple master” units are optional. It supports Asynchronous data rates up to 38.4 Kbps. Electrical interfaces are RS-232, RS-422 or RS-485 electrical port can be multi-dropped. There are two optional versions (Model DTC2100T) for extreme temperature applications (-20°C to 70°C & -40°C to 80°C). Each unit comes standard with two pairs of fiber interface and either 2-Channel RS-232 or 1-Channel RS-422/RS-485 interfaces. The second channel on the RS-232 interface can be used for data, RTS/CTS hand shaking signals or a telephone extension with the Model DTC1900 “Quick-Talk” phone adapter. Local and remote loopback is standard. Diagnostic LEDs are provided to help installation and trouble shooting. Dry contact alarms can be connected to RTUs/PLCs to indicate specifically where a fault has occurred. A test signal generator for verifying link integrity is provided to aid installation and troubleshooting. “Anti-streaming” capability is standard. The DTC2100 is compatible with all popular types and sizes of fiber optic cable and is available multimode (850/1300nm) or single mode (1300/1550nm). Fiber optic connectors are ST or FC. Electrical connectors are DB25 female. Power is 12VDC; optional 24VDC, -48VDC, 125VDC or 115/230VAC with an external power cube. Renowned for its high reliability, the DTC2100 Multi-Drop Modem is ideal for Ring or Self-Healing Ring communication links in SCADA, Traffic Control, Industrial Process Control and Security Networks. It is frequently used to interconnect Remote Terminal Units (RTUs) or Programmable Logic Controllers (PLCs) in Utility substations SCADA Networks.